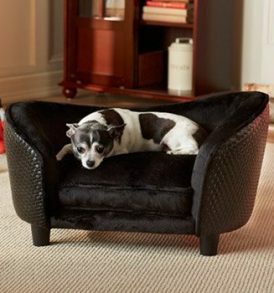 Comfortably fits pets up to 30 lbs. 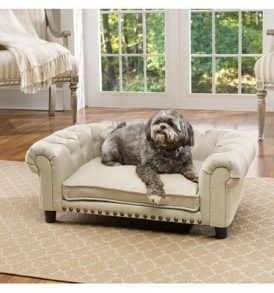 Bootsie, a 20 pound Shih Tzu, loves to lean into the Brisbane sofa, a classically designed, tufted, pebble grain faux-leather sofa which is easy to wipe clean. 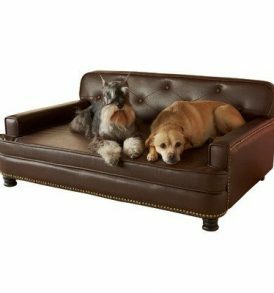 It features brass tone nail heads and furniture grade construction with 2″ wood feet that lift the bed off the floor, keeping your pet draft free. 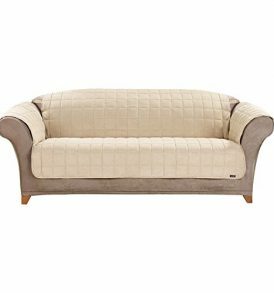 Perfect for pets who like to lean or snuggle when they sleep.